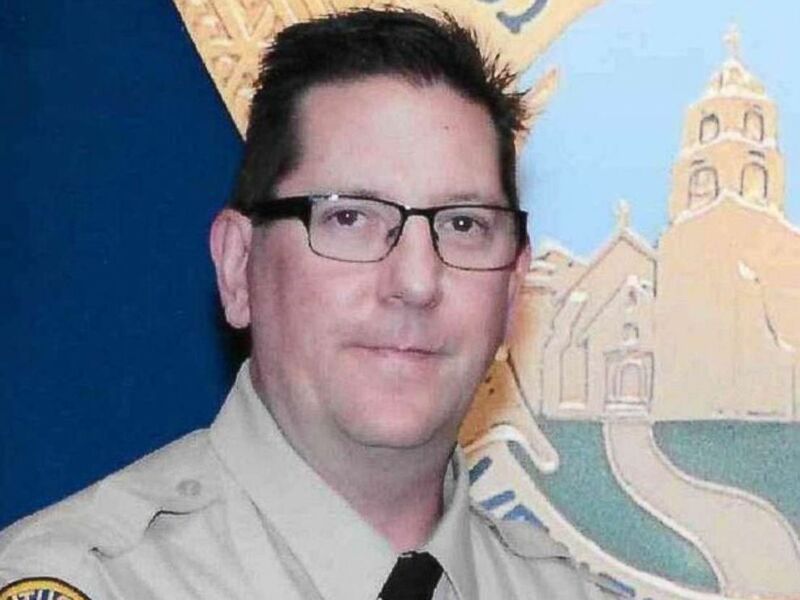 Family, friends and officers gathered Thursday to mourn the sergeant killed in the line of duty in the Thousand Oaks, California, mass shooting. Sgt. Ron Helus, a 29-year veteran of the Ventura County Sheriff's Department, was among the 12 people shot dead on Nov. 7 at the Borderline Bar & Grill, authorities said. Helus, 54, who is survived by his wife and son, was one of the first responders on the scene. He was shot multiple times by the gunman, authorities said. 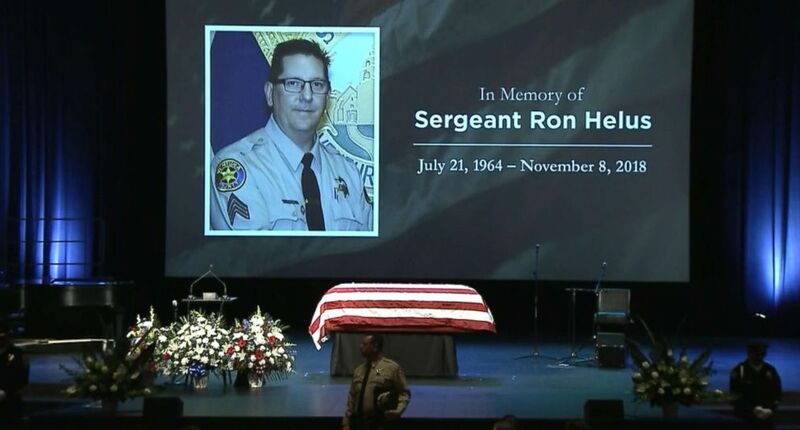 "Ron dared to go where most would flee and he selflessly ran towards gunfire," Ventura County Sheriff Bill Ayub told the mourners at Calvary Community Church in Westlake. "He entered the nightclub with no other purpose than to defend the defenseless" and save lives, which he did, Ayub said. Ayub praised Helus' extensive career and said the skilled sergeant had scouted potential locations for mass shootings in the area, even though Thousand Oaks is considered a very safe community. "Ron, we love you brother and we miss you," Ayub said. "Thank you for showing us all how to be better people. You truly are a hero." The funeral for Sgt. Ron Helus, from the Ventura County Sheriff's Office, Nov. 15, 2018. 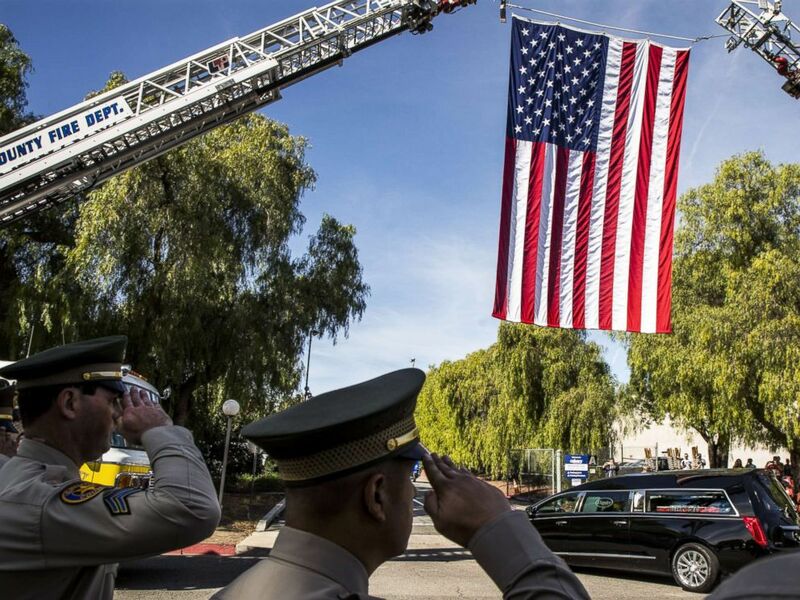 A hearse carrying the coffin of Ventura County Sheriff Sgt. Ron Helus is driven into The Calvary Community Church for his memorial service, Nov. 15, 2018, in Westlake, Calif.
At the service Pastor Charlie Maloney read a letter Helus' wife, Karen Helus, wrote to her late husband. "Thank you for being you. My hero, my love and my life. I will always love you and hold a special place in my heart that is only for you," she wrote. "Save a place up there for me and I will see you again." Ron Helus proposed to his wife at the restaurant that would eventually become the Borderline Bar & Grill, said Pastor Steve Day. Day said the slain sergeant "lived for that job and those deputies." "He loved mentoring and building people," said Day. Billy Ray Cyrus, who performed at the service, also called Ron Helus a "hero." "Ron understood what was most important. He valued people and experiences," added the sergeant's niece, Lauren Smith. "In life and in death he put others before himself." When the report of the shooting came in, authorities said Ron Helus was checking in with his wife on the phone, as he often did during his shift. The last thing he told her was, "I love you."